Our assembly was chartered on January 5, 1915 in Lawrence, Massachusetts. We are a member of the Massachusetts District within the Bishop James A. Healy Province. About The Reverend Father James O’Donnell, O.S.A. The Reverend Father James O’Donnell, OSA was born on April 13, 1806 in County Tipperary, Ireland. After immigrating to the United States, he entered the Order of Saint Augustine as a 25 year old novice in January, 1832 at Saint Augustine Church in Philadelphia, PA. He was ordained in New York City in 1837 as the first Augustinian to make a profession of vows and be ordained in the new American mission. Father O’Donnell was “a man of solemn and serious mien who…possessed formidable resources of energy, determination, and self-esteem,” according to Father Arthur Ennis, OSA, in No Easy Road: The Augustinians in the United States, 1796-1874. He was assigned to Saint Augustine Parish in Philadelphia, Pennsylvania. Because of the social problems in Philadelphia at the time, he had to flee the city to save his life. He traveled to Europe for a few months to avoid the “know-nothing” mobs in Philadelphia. 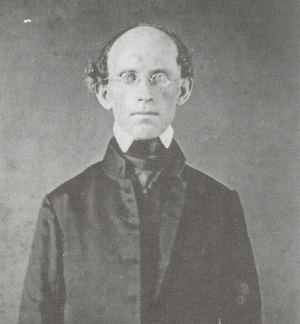 The Augustinian community assigned Father O’Donnell as the first Pastor of the newly founded Saint Mary Church (officially known as the Church of Mother of Consolation) in Lawrence, MA in 1848. Saint Mary’s has become the “mother-church of the Merrimack Valley” and ushered in the ministry of the Order of Saint Augustine into the Merrimack Valley. After his arrival in Lawrence, he celebrated his first Mass in what was known as “Merrimack Hall” on the corner of Common and Jackson Street. This hall was in need of serious repairs. Father O’Donnell soon procured land on Haverhill Street in Lawrence, and here he built a wooden chapel where he celebrated Mass on the first Sunday of January 1849. This is considered to be the first Mass celebrated in Saint Mary Church. The wooden chapel was not completed. Snow was falling on the people as Father O’Donnell spoke from a pulpit, which was nothing more than a stack of shingles. The wooden church proved to be inadequate and Father O’Donnell began construction of the stone church on the outside of the chapel, which was completed in 1853. Seven years later, this building was discovered to be inadequate was and extended to Oak Street. Bishop Fitzpatrick blessed the new church on January 10, 1861. This building became Saint Mary Boy’s School, which subsequently burned on February 12, 1967. Father O’Donnell worked every day helping the poor of the parish. He founded several parish associations to help the young people. He formed Saint Mary Young Men’s Society for the intellectual and moral improvement of the young men in the parish. On August 20, 1859, five Notre Dame sisters arrived in Lawrence from Cincinnati, Ohio. Through arrangements made by Father O’Donnell (including him accompanying their carriage ride from Lowell to Lawrence on horseback), they took up residence in a small wooden house on the site of the former Saint Mary High School. This was their home for thirty-three years. In 1861, Father O’Donnell established The Holy Family Sodality, and the Blessed Virgin Sodality. The mission of the Holy Family Sodality was to sanctify the home and preserve its stability. The Catholic home was seen as the basic social unit where children learned from their parents and siblings. The Blessed Virgin Mary Sodality was an association of Catholics whose members united under the special patronage of Mary. The young men and women of the parish comprised the main body of the Sodality. The purpose of the Sodality was to live exemplary lives as Christians through a profound devotion to the Blessed Virgin Mary. Social functions such as whist parties, plays and lectures were also enjoyed. In addition, Father O’Donnell built a church for the Catholics of Andover (Saint Augustine Parish) where he celebrated Mass every Sunday.